There is no doubt about it, when it comes to warmth and that comfortable easy going way, then the folk of Sutherland have it. The Piper set off mid-morning, making his way North and as he did so the weather eased to find Dornoch bathed in bright sunshine. The town was bustling with people, both local and visitor, and there was a lovely atmosphere around the Cathedral. It was going to be a good day to play the Great Highland Bagpipe. Now as Cathedrals go, Dornoch Cathedral is not the biggest, nor is it the grandest, but what it may lack on that front it more than makes up for with cosiness and warmth, yes cosiness and warmth! For such a large and cavernous building, with sand stone pointed interiors you may think that it would lend itself to a feeling of gloominess or chill, but there is none of that. The glowing sand stone was the epitome of the Sutherland folk themselves warm and welcoming. I reacquainted myself with the layout and decided on this occasion that I would play the brides entrance from the very centre, or cross of the cathedral. This too would assist the organist with the playing of the tune as in Dornoch Cathedral the organist always accompanies the Piper. The two instruments blending together makes for a wonderful sound, which echo’s around the ancient stone walls and beyond. Now the only tune Piper on Parade could play on such an occasion would be; ‘Highland Cathedral’. The Highland Piper kept the tempo that little bit ‘up’ as this was a bridal entrance, not a hymn singing, and having eye contact with the organist made for stopping at the appropriate moment that bit slicker. After the ceremony The Scottish Piper gave a rendition of The Flower of Scotland which saw the bride and groom glide down the aisle in readiness to greet their guests at the cathedral entrance. It fair got the hairs on the back of the neck standing on end! 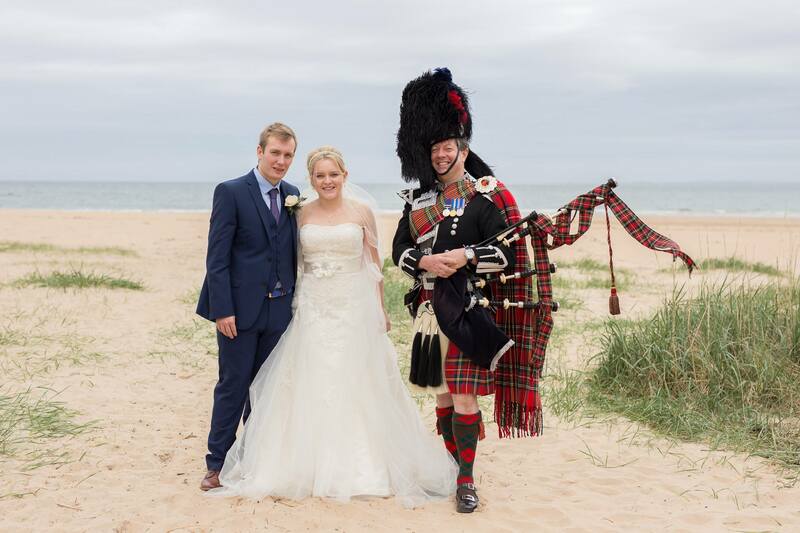 Following some pictures on Dornoch Beach, the party set of for the Royal Marine Hotel, Brora, where Piper on Parade having greeted the happy couple with Heilan’ Laddie and Scotland the Brave played them to their wedding cake for the cutting and then to their seats for dinner. What better than The Mucking o’ Geordies Byre and The Atholl Highlanders to get their guests on their feet, stamping and clapping. 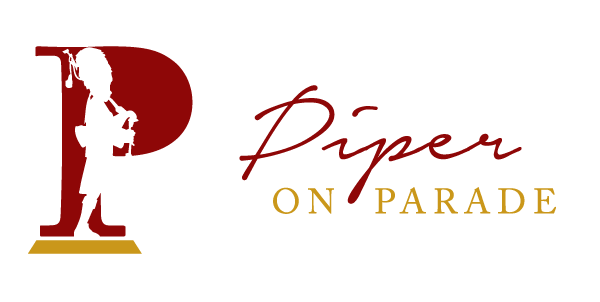 It had been a great day in Sutherland, and that little bit special on a personal note being Piper on Parades home county! I had a great day on Saturday piping at the beautiful Kilmonivaig Church in Lochaber and later at The Lovat on Lochness. It was a first for me at a wedding where I played the Haggis in for it to be addressed by none other than the bride herself, and she was pretty good with my dirk when it came to ensuring its demise! The other first, and great delight for me was meeting Stuart Cassells of Red Hot Chilli Pipers fame, he sought me out and having introduced himself we spoke as pipers do; who we know in the piping world and with whom and where we had played, I thoroughly enjoyed his company for the short time . What gave me a real kick was later seeing the guests including Stuart on their feet stamping, clapping and cheering as I played the Atholl Highlanders. I thought to myself how often have I sat and listened to the Chillis and marvelled at their musical ability and here was one of them appreciating my playing. It gave me a real boost and was a fine end to a lovely wedding. Well that’s the 2015 spring wedding fayres just about finished. Still the odd one about but really its over until the autumn and now its down to business, that said the wedding industry is year round and isn’t really seasonal these days. I’ve been piping at weddings in every month for the last 3 years, and whilst its true that the summer months are the most popular, there are plenty of happy couples wishing to get hitched at other times. With the relatively recent change in the law in Scotland where you can very well get married anywhere, on any day of the week by whoever you wish ( licensed of course) the whole feel surrounding the “W” word is best described as “anything is possible”. I’m glad to say the wedding fayre is as popular as ever, even in this day and age of the internet, Facebook, Twitter and all the like with instant communication across the world, there is still a place for the humble wedding fayre where couples and families may come along and peruse and chat over what is being offered by the industries finest, and talk weddings all day long. Of course its not just the traditional dress maker, baker, photographer, (lots of photographers it seems these days) or piper that are displaying their wares, so to speak there are the new kids on the block, sweet trolleys, table dressers, seat dressers, wishing wells, post boxes, flashing dance floors, not to mention the huge array of venue possibilities, from castles to cottages, to mountains tops and loch sides and anything else you can think off in between, there are venues and suppliers to suit all tastes. The year “20 something” is really and truly a fantastic time to be getting married the choices are endless. Happy planning and hope I will see you soon.